Wontons are wonderful, you can fill wontons with all sorts of things, taco meat, pork, sweet fillings, and so much more. I present to you Nutella Wontons. Nutella is a wonderful chocolatey spread that features hazelnuts as one of the primary flavors. I love Nutella on toast in the morning, but why should we stop there? You can make these wontons at home, and present a dessert to your friends and family that they may have not seen before. Now, if you haven’t tried Nutella, you should go buy a jar of this wonderous treat. You find it in the grocery store, very close to the peanut butter and jelly. If you like chocolate and hazelnuts you Nutella will soon become a favorite of yours. You are going to love using Nutella to fill crispy wonton shells. Heat 4 cups of vegetable oil in a pot to 350 degrees. Make an egg wash using the water and the one egg by placing in a small bowl, and mixing well. Brush egg wash along two sides of the wonton and place about 1/2 teaspoon of Nutella into the center of the wonton wrapper. Seal wonton wrapper by folding the sides together. Place a few into the into oil, do not crowd the pan. and allow this to brown on one side, and then gently turn over, this should take about 30-45 seconds on each side. When browned remove from oil and dust with either cinnamon sugar or powdered sugar. Nutella Wontons are very easy to make, you can make Nutella wontons in just a few minutes. You may want to make a Sundae and place a few of these on the side of the ice cream and drizzle with caramel sauce. 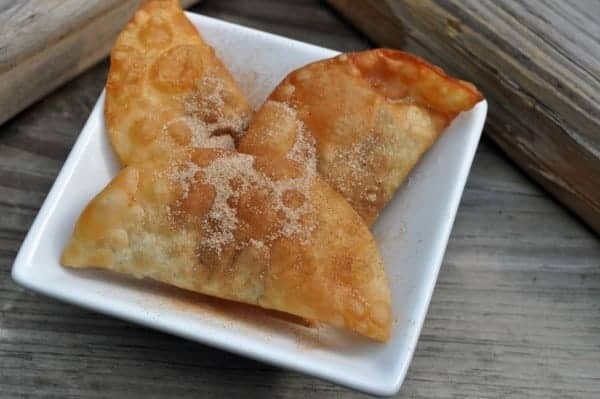 You can even add banana to this recipe with the Nutella in the wontons…and crushed walnuts, if you enjoy a little crunch. Yummm! Your Nutella Wontons look great and would be perfect as an accompaniment to ice cream. YUM!